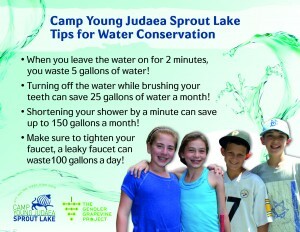 Like most camps, Camp Young Judaea Sprout Lake, located in Verbank, NY, uses a lot of water every summer. Since they use a well, conserving water is important so they can avoid having to tap their back-up well. In order to dramatically reduce their water usage, Sprout Lake applied for a Gendler Grapevine Project grant to purchase and install 40 new Water Sense Low Flow toilets. The new toilets replaced very old toilets that used 6 gallons of water each time they were flushed. The low-flow toilets use 1.28 gallons of water with every flush. 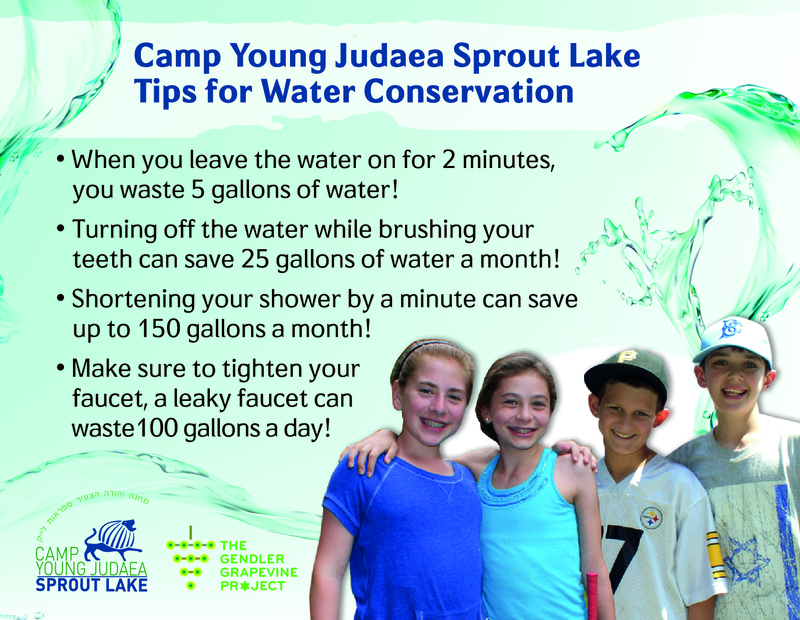 In addition to the installation of new toilets, the Camp displayed water conservation facts in every bathroom, which encouraged campers to practice skills such as turning off the water when brushing their teeth and taking 5-minute showers. As a result of these conservation efforts, the camp saved 6,000 gallons of water every day. Significantly, for the first time ever, they didn’t have to use their emergency well! Campers also participated in water conservation activities within the umbrella of their outdoors/nature department. Campers learned the importance of water conservation and how to bring it to their home and local community. Finally, each camper family went home with a water conservation packet, which included a magnet on how to conserve water and a water pitcher. When camp families use the pitcher, it is Sprout Lake’s hope that it reminds them of water usage and that they will think more deeply about their use of water. Working through a local plumbing company in Poughkeepsie, NY, Sprout Lake was able to find the best toilet to fit their needs. They chose to purchase the Kohler Wellworth Toilet Round Front Bowl Two Piece 1.28 GPF (gallons per flush). They decided to buy this toilet because, of the toilets their supplier had available, it had the lowest flow with the highest reviews from other consumers. During camp season, the average toilet is flushed at least 50 times a day. Given this high usage, they chose to buy a toilet for “commercial use” and not “residential.” The camp’s supplier also noted that the Kohler Wellworth Toilet is known to have long life! The toilets cost $146 each, which included a nonprofit discount and a bulk rate discount. With these discounts, they were able to save approximately $15 to $20 on each toilet. The facilities manager and assistant installed all 40 toilets. This project didn’t take a long time to complete and has had great results. It took about a month and half to complete from the ordering to the installing. Their facilities staff was able to complete this during the winter because it was an indoor project. As for what happened to the old toilets? The facilities manager organized for a recycling company to come and pick up them up. They were too “used” to donate.